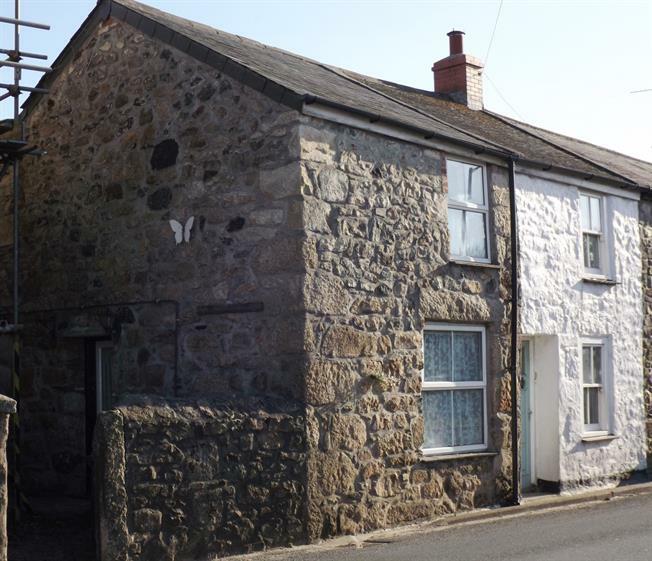 2 Bedroom End of Terrace Cottage For Sale in St. Ives for Guide Price £130,000. This two bedroom end of terrace granite cottage offers cosy living spaces with some lovely original features. This double glazed, gas centrally heated cottage offers accommodation which comprises in brief of; a living room with exposed beams and feature fire place, a dining room and kitchen overlooking the rear garden. On the first floor there are two double bedrooms and a shower room. To the rear of the property is a small garden. An internal viewing of this property is highly recommend. A white high gloss kitchen with vinyl flooring, a single sink with drainer, a four ring hob with integrated single oven and space for a fridge freezer. From the kitchen there is a step down to the rear door which leads out into the garden. A carpeted first floor landing with access into the two double bedrooms, the shower room and W/C. A double bedroom to the front of the cottage with carpeted flooring, a radiator, a double glazed window to the front and a pedestal wash hand basin. A double bedroom to the rear of the cottage with carpeted flooring, a radiator, a double glazed window overlooking the rear garden. A shower room with single shower cubicle, a pedestal wash hand basin, a radiator and cork tiled varnished flooring. A varnished cork tiled flooring and toilet with overhead cupboard storage. Outside to the rear of the property is a small garden with a patio area and a large which is laid to lawn.